The "Community Segmentation" product name announced on the cover of the paper version of this Fall 2003 ArcNews has been updated to "Community Tapestry." 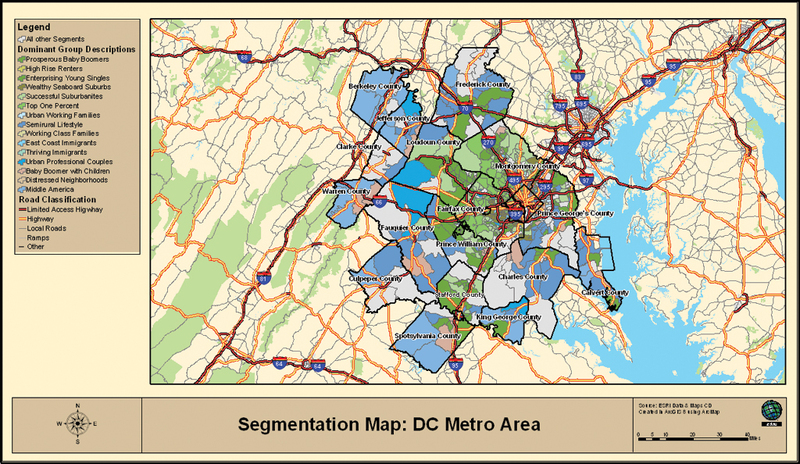 Washington, D.C., metro area by lifestyle segment. Esri's business divisionEsri BISis releasing a new demographic data product called "Community Tapestry." This product is a segmentation system that uses a variety of statistical tools to group population households by behavior. 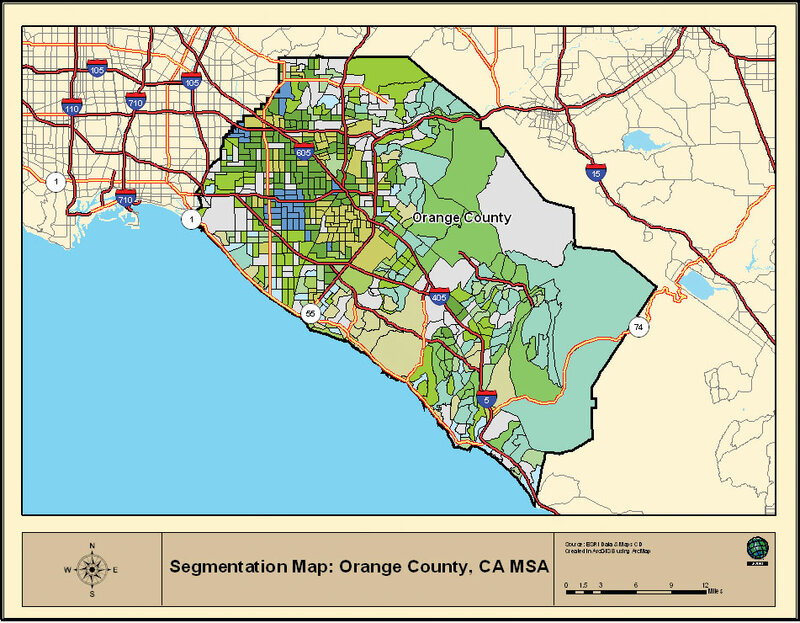 More than 20 years ago, the first segmentation system (ACORN) was created to group neighborhoods based on socioeconomic and demographic composition. ACORN improved the ability to predict behavior of social groups that were geographically clustered. Demographic segmentation has high value in marketing and targeting efforts. Businesses have long recognized and used market segmentation systems for customer profiling, direct mail analysis, site selection, new product development, and media buying. Local governments can also take advantage of a segmentation system for civic and growth planning. Segmentation systems can also help educational institutions with fund-raising. The quality of the data and experience of the demographers are very important to the success of any segmentation system (see "What Is a Segmentation System?"). The Esri Business Information Solutions (BIS) team of demographers, statisticians, and data developers building Community Tapestry is led by three experts with decades of combined experience in the field. 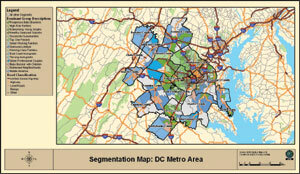 A segmentation system clusters neighborhoods based on socioeconomic and demographic composition. "From their development and work with most of the segmentation systems in existence today," says David Huffman, managing director, Esri BIS, "our team members are uniquely qualified to build the next generation of market segmentation systems. Over the years, these experts have also been closely involved in the development of segmentation methodologies that are now industry standards." Accurately profile current and prospective customers, members, or constituents. Reveal untapped potential in existing markets. Tailor marketing campaigns and merchandise mix to consumer markets. Define markets for expansion efforts. Esri BIS is a team of professionals who focus on meeting and supporting the specific needs of the business user through solutions that include products and services. Built with Esri BIS 2003 data, Community Tapestry will seamlessly integrate into current and future software products from Esri and Esri BIS. Community Tapestry will also be available through project work, by license, and on the Esri BIS Web site (www.esribis.com). For more information about Community Tapestry, call Esri BIS (East: 1-800-292-2224 or West: 1-800-394-3690) or visit www.esribis.com/tapestry.